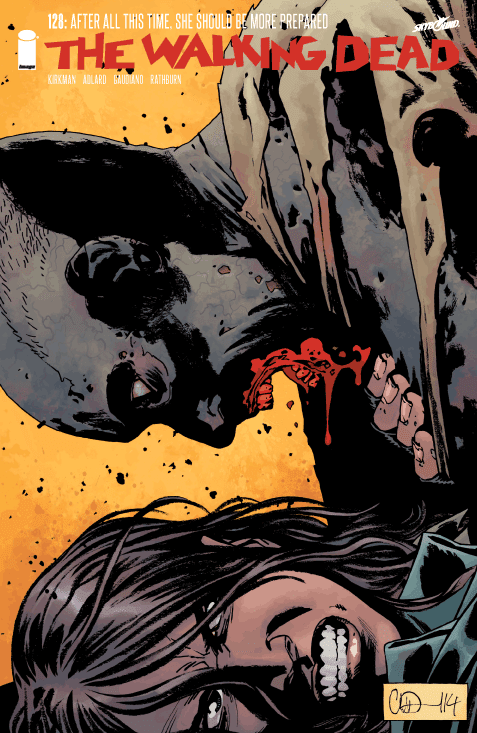 This issue picks up directly where the last left off, with Negan and Carl. Carl had just reminded Negan that he does indeed still wish to kill him. Negan feels a little taken back by this though, thinking he and Carl were friends. I'm not too sold on that, I'm sure Negan will say anything at this point to get people to like him. The next day goes on like usual, Rick is making his rounds and checking that everything in the town is going according to plan, Andrea is doing some extensive interviewing. Making sure to write down every possible detail she can about every person. At least Carl has made some real friends, and even picked up whittling. He makes animal carvings out of blocks of left over wood and sells them to the neighborhood people. That's really good for him, as it gets him out there and social for once. Lord knows that damn kid needs it. Meanwhile, out on a regular round up two soldiers run into some walker trouble. Heh, get it. RUN into some WALKer trouble. I'm a hoot. They're under Maggie at the Hilltop, I'm guessing she sent them to drive away herds, as Rick was doing. Seems like a great idea, very safe and if done right, very effective. Back at Rick's town, Eugene is having some troubles with Rosita. He doesn't think he's man enough for her and she's only with him because he's the only one around, and it doesn't help she's leaving him notes at home telling him not to wait up and she'll be out late. Someone's out partying with the walkers tonight! Also, Rick finally decides to let Carl head to the Hilltop to learn a trade. He feels it's now safe enough to let his son grow and become a man, and hopefully not a crazy time bomb. But we all know what's happening there, right? The new people have all been living in one house together and they're not liking the treatment. Personally, I think they're crazy. Not crazy like bad guy Negan crazy, crazy like stupid crazy. Of course this thriving group is gonna be suspicious of all new comers, that's just the world they live in. That's how things work in those days. You have to expect to not be trusted by everyone right away, and the fact that with that mentality they got this far, makes me think they're the ones who aren't to be trusted. But there's only one way to figure that out, you'll have to be back in another couple weeks to see.